The launch of our Logical Color Heat Transfer film has been a resounding success. Logical Color WarmPeel Universal is a huge hit with those who want a do-it-all film that supports high volume production. WarmPEEL CP is popular with those looking for a basic warm peel film for cotton, polyester, and blended garments. 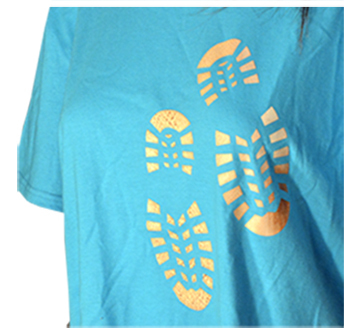 Why would we offer such great cuttable T-shirt vinyls and ignore our customers who want a printable heat transfer film? That wouldn’t be… logical would it? It wouldn’t. So we didn’t. If you’re looking for an economical, warm peel printable t-shirt vinyl for cotton and polyester, we have good news for you. We now have three Logical Color printable heat transfer films. All of them are designed for print and cut workflow using a large format digital printer and a vinyl cutter. Integrated printer-cutters work too. The workflow involves printing, cutting, and weeding. Yes weeding. Weeding gets a bad rap these days. There are other transfer methods in garment decoration that use self-weeding papers. But those papers can be difficult to master, and the transfers don’t hold up as well as appliqués from a solvent-based inkjet printer. The heat press application of printable heat transfer ‘vinyl’ is simple and forgiving. If you can apply cuttable HTV, you can apply WarmPEEL CP PRINT with no problem. Appliqués made with Logical Color WarmPEEL CP PRINT are also more washfast- more durable – than most laser transfers. In fact, they’re as durable as screen printed shirts. But unlike most screen printed shirts, WarmPEEL CP PRINT graphics offer the high resolution and photographic quality of digital inkjet technology without the hassle of color separation and exposing screens. You can create vibrant artwork for one or two shirts and sell them at a profit. WarmPEEL CP PRINT is a 4.8 mil (120 micron), matte white PU-PVC film. It’s designed for application on cotton, polyester and cotton-poly blends. Since it’s part PVC, this one is truly a printable t-shirt vinyl. The special PU-PVC top coat produces extremely durable color for vivid, long-lasting prints. The other benefit of this construction is cost. At prices as low as $1.40/sq foot, WarmPEEL CP PRINT is our most affordable Logical Color printable film. It’s an outstanding value for those who want an opaque, durable, printable vinyl. And since printing is only the first step, you’ll be happy to know that it’s also easy to cut and weed. The PU hotmelt adhesive on a non-adhesive liner supports easy cutting and weeding, even for small characters. • Print with solvent or eco-solvent inkjet printers. • Design and print your image right reading (not mirrored). • Remove the polyester liner and place tacky-side down on your garment. • Place them on a heat press and set it medium-to firm pressure at 320°F (160° C). • Press for 15 seconds. Peel the tape warm. Sizes and prices: WarmPEEL CP Print comes in 20″ wide rolls. Perfectly sized for most t-shirt transfers. Roll length options are five, fifteen, thirty, and 81-feet. 20″ x 5 foot rolls are only $12.99. We weren’t kidding about it being affordable. All of our Logical Color printable heat transfer films produce high quality, opaque, durable transfers in a print and cut workflow. For WarmPEEL CP PRINT, you’ll need an ecosolvent inkjet printer, a vinyl cutter, some weeding tools, and heat transfer tape. Don’t use standard sign vinyl application tape. It’s not happy at 320° F. Speaking of tape, Warm Peel CP Print works well with ATT450 and ATT500L. Siser TTD EasyMask is also a good choice. To optimize print quality, you should use custom ICC profiles. PrismJET VJ54 and VJ24 owners can download ICC profiles for WarmPEEL CP PRINT from our Technical Support blog. Since so many of our customers love WarmPeel CP, we felt adding a line of comparable printable t-shirt vinyl for our PrismJET customers was a no-brainer. Now the outstanding quality and value of WarmPEEL CP for cotton and polyester apparel is accessible to PrismJET customers and others using eco-solvent printers and printer-cutters. You’ll get opaque, vivid, durable transfers at a great price. Try a roll or two this week. It’s the logical thing to do.